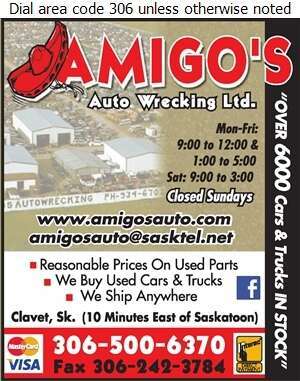 Amigo's Auto Wrecking Ltd. has been in service for over 26 years. We are proudly one of Canada's biggest and best stocked yards specializing in domestic vehicles, imports and all trucks. We ship anywhere and buy all types of vehicles, big or small, running or not. Whether you are looking for a vehicle that is from present day or an antique from the past we are your one stop wrecking yard.